If I told you that you could do laundry without detergent or soap, you’d probably think I was one towel short of a full load. And I wouldn’t blame you. Detergent has been the mainstay of washing clothes since the Babylonians first made soap in 2800 B.C. 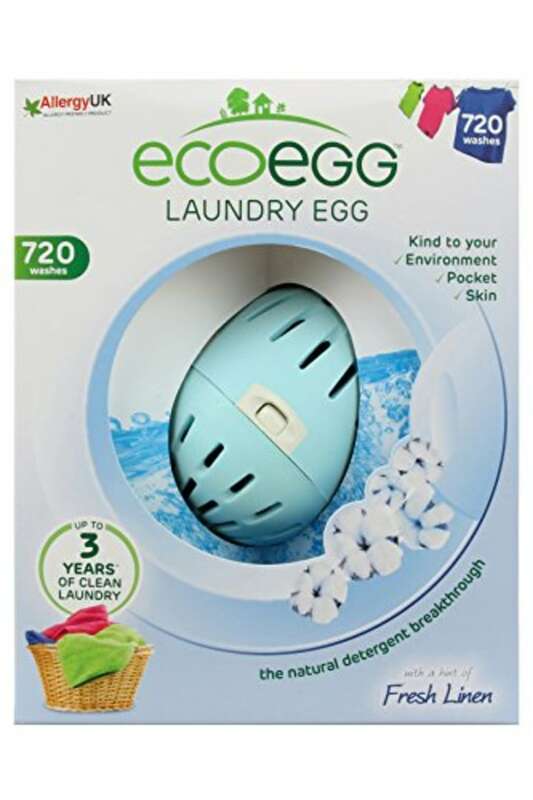 It’s taken more than 4800 years, but there’s a new kid on the cleaning block (not from Babylonia but the United Kingdom) and it's called the Laundry Egg by Ecoegg. It really does clean clothes without soap or detergent. Also available at The Grommet for $30. The Laundry Egg comes in an egg-shaped, durable plastic container with slits all around it that allow water to flow in and out. Inside the egg are two types of pellets, each about the size of a small green pea. The tourmaline ceramic pellets help weaken the bond between dirt and fabric. These pellets do not have to be replaced. The mineral pellets naturally ionize oxygen molecules in water. Ionized water penetrates deeply into fabric and lifts away dirt without fading colors or damaging fibers. The mineral pellets also increase the pH level of the water, making the water — and the laundry — softer. That means you don’t have to add additional fabric softener. These pellets dissolve over time and need to be refilled when they reach half their size, about every 72 washes or so. Replacement pellets are included in the package. I've learned a few tricks since trying out this new invention. Since the Laundry Egg has to circulate freely throughout the wash, it needs lots of water and lots of room to move around. So, wash in smaller loads (I use medium loads) and at a higher water level (I set the water level for a large load). Other than that, load the washer, drop the Laundry Egg on top and start the cycle as usual. It’s OK to use stain removers on tough spots or to add oxygen bleach or fabric softener if you wish. These won’t affect the cleaning power, and you can wash in any water temperature. I prefer hot water for towels and sheets. One more thing and I’ll get off my soap box: I can’t believe how inexpensive this product is — from about 3 cents to 13 cents a load, depending on the size and fragrance you buy. It comes in 210-load, 432-load and 720-load packages, so you’ll only be ordering it once every 1-3 years. Not bad! There's also a great video about Laundry Egg if you want to see it in action. This article was originally published on October 9, 2017.